Deli, Grocery, Gas Station, Coin-Op Laundry & Shower, USPS Post Office. We recommend the Rimrock Lake Cafe for food, and Silver Beach Resort for milkshakes. Each are approximately 10 miles to the East on Rimrock Lake (Summer only). Naches and Yakima offer a cornucopia of dining and wineries. We recommend the Blue Spruce Tavern for food, and Blanton's Grocery Store. The town of Packwood (20 minutes west of the pass) has a coffee roasting shop, restaurants, other road services. Offered in the summer months. Perfect for dining outside with your family and friends! Campfires allowed only when no burn ban in effect. Most units have an individual locker or locking ski rack on deck for storing your ski equipment and other outdoor gear. Located on the ground floor or in the hallway next to your unit. Units and beds are not made up daily, please contact the office if you have special needs or require additional towels or toiletries. Logged and kept for a minimum of 90 days. 52 units are available for a wide range of group sizes and events. Weddings, corporate retreats, and family reunions have all been part of the summer at White Pass. A grass area adjacent to the parking lot can be used for setting up large tents and covered areas. Catering is available from the local towns of Naches and Packwood. 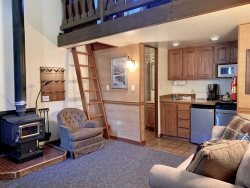 Your complete ski, snowboard, cross country ski and snowshoe mountain environment! Full service ski rentals, retail shop, and equipment sales. Lifts do not run outside of the winter season. For more options (updated weekly), the Highway Shopper newspaper and tour guide is a great resource!